Above: Joe Thornburg of Vicksburg and Marc Melson of Gobles, holding the check, won the 2018 Midwest Open Ice Fishing Tournament near Brooklyn. The two winners are shown with Jan, Jim and Tom Knutson. Once again Mother Nature is playing havoc with ice fishing in the state of Michigan. The date has been moved from Sunday, Jan. 27, to Sunday, Feb. 10, with fishing starting at 8 a.m. on Wamplers Lake and concluding at 1 p.m. The top prize is $20,300 for the winning two-man team. The official weigh-in ceremony will take place at approximately 2 p.m. at a yet-to-be-determined location. The weigh-in is normally at Columbia Central High School, but that venue is unavailable on Feb. 10. Temperatures are expected to be well below freezing in Jackson and Lenawee counties in the next two weeks – good for ice producing on local lakes. Teams consists of partners trying to catch eight good sized bluegills and eight crappies during five hours of ice fishing. Anglers from Michigan,Canada and 10 other starts will be competing for the big check and other prizes. Last year Joe Thornburg of Vicksburg and Marc Melson of Gobles edged out a pair of local anglers with 10.35 pounds of fish. 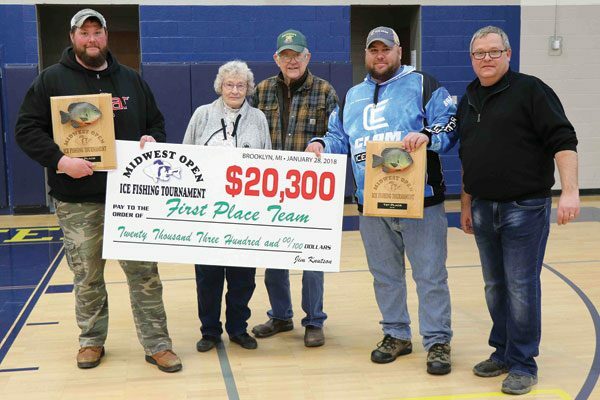 They also won the Midwest Open Ice Fishing Tournament in 2014. Grant Neblo of Onsted and Bronson Burch on Manitou Beach took the second-place prize of $3,500 for 10.25 pounds of bluegills and crappies. David Kaiser and Joe Miskowski of Jackson claimed third place with 9.3 pounds of fish. They earned $2,000 for third place. Former champions Keith and Ron Kniffen of Eaton Rapids won $1,000 for fourth place with 8.8 pounds of fish. All four of those weights would have won the title in the last decade of the Midwest Open Ice Fishing Tournament. Sponsors of the tournament help organizers hand out nearly $40,000 in prizes and merchandise during the rules meeting on Saturday night and weigh-in ceremony on Sunday. For more information on the Midwest Open Ice Fishing Tournament, go to http://www.midwestopentournament.com/.